Your school can visit The Portico Library to learn about our history and our amazing collection, which covers a wide variety of subjects, such as Local History, Poetry, Science and Mythology! As part of The Portico Sadie Massey Awards we can also offer subsidised Reading and Writing workshops. Whatever your goals, we can be flexible in helping you to design the perfect workshop. Read on to learn more about the local authors we work with to encourage a life-long love of literature and learning. Contact us or download our flyer for more details! We recommend anyone wishing to book a workshop reads this helpful guidance from worldbookday.com and societyofauthors.org. When Marie Basting was fifteen, she was told by a careers advisor that girls like her don’t become writers. For a long time, she believed this. But then something magical happened and Marie finally came to realise that girls like her can do anything they want. Princess BMX, her debut novel, will be published by Chicken House in August 2019. A highly experienced learning practitioner, with a relaxed friendly style, Marie has an MA Creative Writing and a Level 7 qualification in Action Learning. As an Assistant Regional Advisor for the Society of Children’s Book Writers and Illustrators, Marie supports the development of writers and illustrators at all stages of their careers. She also offers freelance creative writing tuition to both adults and children and is an Associate Lecturer at Manchester Met University. Jack Nicholls is an award-winning writer of poetry, plays and fiction. His debut poetry pamphlet Meat Songs was published by The Emma Press and praised by Sabotage Reviews for ‘its surrealism, its dark comedy [and] its pitch-perfect sense of style […] Nicholls has a voice all his own.’ His poems also feature in The Poetry Review, The Tangerine, and The Best New British and Irish Poets 2017, among many other publications. A member of the Royal Court theatre’s ‘Writer’s Group North’, his debut full-length play Harsh Noise Wall was read at the Court and Northern Stage, Newcastle in the summer of 2018; he’s also performed comedy with a sketch group at the past three Edinburgh Fringe Festivals. As an educator, he is professionally experienced in providing engaging workshops to children and adults of all abilities and needs. 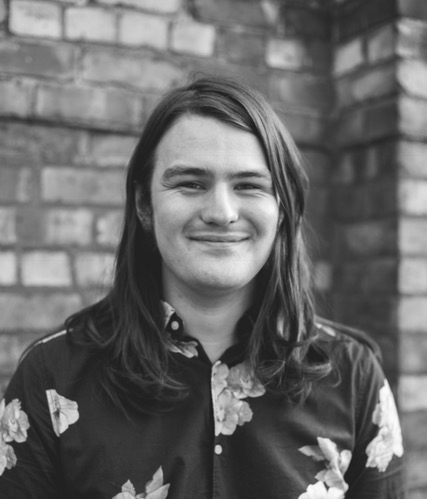 Reece Irvin Williams is a graduate of the prestigious Liverpool Institute for Performing Arts, holding a 2:1 BA Hons in Music, Theatre and Entertainment Management. He is a Mancunian poet of Jamaican and Trinidadian heritage. Having been a member of the Young Identity and Inna Voice spoken word collectives since 2007, Reece now acts a Peer Mentor and Project Administrator for Young Identity. Since joining YI, Reece has performed on the local, national and international spoken word scene (Brave New Voices, 2008 & 2009; NuYorican Poets Café, 2010).